Let's get together to try this fun Japanese American restaurant! A three-floor Japanese joint specialising in wagyu buns and ramen. Love a quirky interior? A three-floor site once home to Chinatown institution HK Diner is now a riot of Japanese technicolour. The three-storeyed space pays homage to the post-war culture of Japan, with kitsch nods to retro American diners pared back with Japanese-style granite, a row of Pachinko arcade games lining the basement bar, and madcap collages of Japanese fishing flags and manga cartoons adorning the walls. Downstairs, you’ll stumble on a cocktail bar serving up smoked whisky negronis and yuzu and grapefruit collins, while upstairs, amidst the traditional Japanese sunken tables and leafy greenery, you’ll find the grub. Inspired by the food culture of Hokkaido, Japan’s Northernmost island, they serve up dishes like fresh hand-rolled sushi, snow crab spring rolls, and vegan-friendly ramen made with a shiitake mushroom stock. 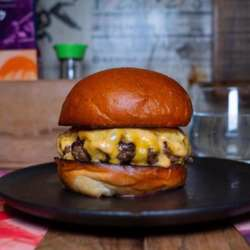 The big event, however, is (unsurprisingly) the buns – including wagyu beef in sake yeast buns; a souped-up fish finger burger; and a panko crusted fried beef patty with Japanese vegetable pickle and curry ketchup. You can top it all off with desserts like green tea profiteroles, or shakes, like the milk and cherry ice cream, with marinated cherries, marshmallows and cherry sauce.